Hello beautiful! This post is all about the “best drugstore concealer.” Thank you so much for always coming back and I am back with another informative article and that is the ” best drugstore concealer” that is not cakey and won’t make you look like a ghost. I never liked a concealer for many reasons like cakey face, unnatural look etc but makeup artists can’t do without this makeup product and they are absolutely right. There’s nothing wrong with these concealers but the way we use it and the right product that won’t make you look cakey and slide your face off. Concealers can hide the acne marks, blemishes, pigmentation etc. It’s the most useful on the days when you see that big zit on the special occasion. It’s scary and nobody wants to go through it. right? Today I am here to tell you everything you need to know about the concealers and what is the best drugstore concealer available easily and is perfect for all the skin types. Why do we use a concealer: We all crave for a flawless skin complexion and that can only be achieved by using foundation and concealer. If your skin has discolorations, uneven skin tone, pimple scars, pigmentation etc, you can hide these areas with the help of concealers. The concealer works wonders when applied together with the foundation to achieve the even and flawless look. What do you apply first, a foundation or a concealer? You always apply a foundation first and then a concealer. Foundation gives the coverage and works as a base, even out the skin and you can apply concealer after that to cover the spots and blemishes that can not be covered with the foundation. The concealer is applied after foundation so that you come to know where you required further concealing. It won’t look cakey this way because obviously if you apply two thick layers of foundation as well as the coats concealer, it causes creasing and creates a heavy look. Before applying a concealer, always moisturize your skin with a lightweight moisturizer to provide enough hydration to the skin so that it becomes soft. You can use the eye cream as well for the better results, you don’t need to apply the moisturizer. A little dab is required to cover any spot. Don’t apply too much, it can look cakey. Always take less quantity, just dab a little bit and you can always add up more if required. Always use your ring finger or a small fluffy concealer brush to apply the concealer on the spot. If you are applying it under your eyes, don’t apply too close to your eyes. Wait for two minutes and then set the concealer with the help of setting powder. Blending is the key: Always blend your concealer well but don’t rub. Just pat it nicely enough and apply it on the spot and around the spot. Remember not to use too much to avoid the cakey look. There are many drugstore concealers available in the market. Obviously, you don’t want to waste money on expensive concealers that you end up wasting because of the wrong color selection. It happens a lot. I recommend you to start it with the drugstore concealer and I will help you in selecting the best one. These are all the best drugstore concealers and you can choose one according to your requirement. Product Details: I need to tell you this that most of the beauty bloggers rave about it and it’s one of their favorite concealers. It contains haloxyl that helps to reduce the puffiness. Our under eye area is usually dull and it provides radiance and refreshment to the under eye area. It helps to erase dark circles and fine lines. Texture: The texture is super creamy and lightweight. It does not look creasy and cakey and easily blends out with the skin. Staying Power: This concealer does stay for good 6-7 hours and it does not feel greasy. You must apply a moisturizer to make it nongreasy. Packaging: There are pros and cons to this packaging. It’s not a wand applicator. It’s a twist top. You need to twist the sponge for the product to come out. It has a sponge and enough product does not come out and stays on the sponge. You have to use the sponge again and again and that it times is unhygienic but overall, it’s a travel-friendly product. Coverage: It does not have full coverage but medium coverage. Price: Available at Rs 1299. here. Availability: Easily available online and at Maybelline stores. Lightweight does not settle into fine lines. Provides medium to high coverage. You only need a pea size. Packaging. It’s a hassle to use the product at times and of course, there is lots of wastage. Overall, it does the job of covering the redness, puffiness, and blemishes and you can definitely buy this product. LA GIRL HD PRO CONCEALER: This concealer is used by the top-notch makeup artists in the world and you will read all the reasons. A product description is given by the company: Crease resistant, opaque coverage in a creamy yet lightweight texture. The long-wearing formula camouflages darkness under the eyes, redness and skin imperfections. This bendable and buildable formula provides the ultimate, customizable coverage. 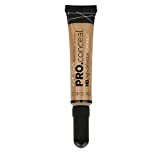 This must have concealer includes a soft brush tip for easy application. Provides complete, natural-looking coverage, evens skin tone, covers dark circles and minimizes fine lines around the eyes. Camouflages the appearance of skin imperfections evens out skin tone, covers dark circles, minimizes fine lines, provides customizable coverage. Texture: Creamy texture with a smooth consistency. Does not look greasy and patchy. Packaging: It comes in a tube from which the product can be easily squeezed. It comes with a soft brush applicator. Again the packaging is unique and it’s easier to apply the product but the product gets wasted but overall, it is a travel-friendly packaging. You can easily carry it with you. Price: It comes for Rs 499. which I feel is quite reasonable. Availability: It is easily available online but it’s difficult to find these concealers at the stores. Shades: The best part about these concealers is that they are available in a variety of shades. The color selection becomes easier. Green is used for acne, red is used for dark circles and yellow is used for brightening the under eye area. Staying Power: It does stay for 7-8 hours. It has good staying power. Coverage: It provides medium to high coverage and that’s the reason these concealers are used for contouring and highlighting as well. Price is quite reasonable for the quality it provides. It provides medium to high coverage. Can be used for contouring and highlighting as well. Easily cover up the blemishes and scars. Does not sit in the fine lines. Does not look cakey and patchy. The packaging again. I don’t like to waste the product. It gets wasted. Be careful with the squeezing because it takes a while to come out and then bam lots of product comes out all at once. Be careful with it. You need to use your ring finger or a concealer brush. There is no use of that brush that comes along. It’s not easily available in India but you can get it online here. L’Oreal Paris True Match Concealer: This is again one of the most popular concealers. Product Details are given by the company: True Match’s Opti-Match technology contains ultra fine pigment match every skin tone and texture with extreme precision. The super-blendable formula gives a freshness finish that does not cake or streak. Dot concealer on to blemish or under eye circles. Using your finger gently tap concealer into your skin until fully blended. To set concealer and prolong wear dust concealer with powder. Oil-free and non-comedogenic: Does not clog pores. Texture: It is a liquid concealer but it also has a creamy texture. It is not runny but smooth. Packaging: The product comes in a see-through tube. The packaging is beautiful and transparent so that you can see the product clearly and it comes with the brush applicator that is smooth and does not irritate your eyes. Price: It is available at Rs 792. Staying Power: It stays for 6-7 hours. Coverage: It provides medium to high coverage. It is buildable because of its liquidy texture, you can easily build up the layer as required. Availability: It is easily available online and at the stores. Does not settle into fine lines and accentuate pores. Stays for a good amount of time. Does not break out the skin. Product details were given by the company: Creamy concealers in 8 shades, simple to use and a must-have multifunctional product! Can be used on its own for a flawless base, spot correcting, highlighting or contouring! Great to clean up your brows or brighten under the eyes! One swipe to erase your woes provides medium to full coverage, buildable, lasts all day! Best Suitable for dry skin. Use: Warm up the product in between your finger and apply of the desired area. Texture: It has a matte finish and creamy texture. It is easily blendable. Coverage: It provides medium to high coverage. Staying power: It stays for about 5-6 hours. Shades: Shade selection is quite good. It is perfectly made for Indian skin tones. Price: It is available at Rs 595. Packaging: It comes as a crayon pencil and it’s quite easy to use and travel-friendly. It can be used for highlighting and contouring. It stays for a good period of time. Suitable for all Indian skin types. It’s not easily available at the stores. NYX professional HD concealer: It is considered as a perfect dupe for NARS concealer because this gives similar results and that too at reasonable price. Product details were given by the company: Available in 10 shades to accommodate a wider range of skin tones, the NYX Professional Makeup best-selling HD studio photogenic concealer effectively covers imperfections, discoloration and under eye circles without ever looking cakey or obvious. The result is beautiful, natural looking coverage you can count on. Texture: It has a thick creamy texture with a smooth consistency. Packaging: It comes in a plastic tube that is transparent and it comes with an applicator. It is a travel-friendly product. Coverage: It provides medium coverage and you don’t need much, just dab of product and you are good to go. It can be layered easily if you require more lately. Price: It is available at Rs 905. Shades: Comes in a variety of shades. Staying power: It is waterproof so it stays for quite a good period of time I love about i.e 8-9 hours. It gives medium to full coverage. Easy to build the layers and does not look cakey. The formula is very smooth. Stays for at least 8-9 hours. Perfect dupe for NARS concealer. It dries very quickly so you need to apply it fast and apply a hydrating cream or a moisturizer before applying this. It is easily available online but not at the stores. Product details given by the company: Faces ultimate pro concealer has an oil-free formula that prevents the concealer from clogging pores. The oil-free formula is perfect for hiding imperfections, birthmarks, dark circles, scars and more. It naturally masks all blemishes giving radiance to the skin. It blends effortlessly and melts into your skin after application. It has SPF 10 to protect you against the damaging actions of sun rays. Texture: It has a very smooth texture and it blends easily with the skin. Packaging: It comes in a transparent tube so you can always keep a check on how much product is left in the bottle. You can easily carry this bottle anywhere with you. Staying power: It stays for 5-6 hours. It needs retouch as it stays for not more than 5 hours. Price: It is available at Rs 649. It blends with the skin easily. It provides a smooth finish as the formula is very smooth. Cover the blemishes and spots easily. The shade selection is limited. Product details were given by the company: For makeup that doesn’t mess with you and lets you bring out your inner beauty flawlessly, Maybelline New York brings the new Fit Me! concealer. With the Fit Me! concealer you’ll get the ultimate touch-up coverage for any dark spots or imperfections. You can bid goodbye to any imperfection that holds you back. Texture: It has a creamy yet lightweight texture. It does not settle into fine lines and easily blends out with the skin and gives a natural finish. Packaging: It comes in a plastic slim tube with a brush applicator. The packaging is very convenient and travel-friendly. Staying power: it stays for long and it is easily buildable. Price: It is available at Rs 500. It gives a natural finish. Feels light on the skin and not heavy. It stays for a long period of time. It hides blemishes and acne scars. It can be layered up easily. Fit for every skin type, also for sensitive acne prone skin. The ingredient list is not provided. Product details given by the company: Hide those little skin imperfections like a pro and get a smooth, natural look! Revlon’s latest colorstay concealer with the new time release technology balances imperfections for an absolutely unblemished look, for up to 24 hours. This silky liquid concealer is easy to blend (it doesn’t set instantly so you have time to dab-and-blend to the desired level of coverage) and, true to its name, it really lasts. The concealer sets to a soft, dimensional matte finish that doesn’t look the least bit dry or cakey. It’s surprisingly skin-like and yet you get medium to nearly full coverage. It’s a winner for concealing everything from dark circles to brown spots and red marks from breakouts. In fact, the formula is well suited for breakout prone skin. Texture: It has a creamy texture which glides on easily. Packaging: It has sturdy and travel-friendly packaging. Staying power: The staying power is okay. It stays for 4-5 hours but again you can build it up easily. Coverage: It gives low to medium coverage. Price: It is available at Rs. 725. It does not stay for long. Coverage is okay and not that good. These were the best drugstore concealer that are suitable for almost all the skin types. Why do we need a concealer? How to use a concealer. I hope now you are clear about your choice. However, being a beauty blogger I want to recommend you something. Please don’t use the concealer every day. It can clog the pores. The concealer has thick consistency than foundation and it’s not good for your skin on an everyday basis. It can clog the pores resulting in the breakouts. You can use the concealer if you have mild dark circles or discolorations here and there but if you are suffering from severe dark circles, you must visit a doctor and try to use the natural home remedies on how to get rid of the dark circles naturally at home. I have mentioned the best drugstore concealer that is easily available and are raved about by the popular and big makeup artists. If you found the information useful, please share it on your social media channels like Facebook, Instagram etc. Show us some love and we will come back again with another informative article. Want to read more? Have a look at the most popular articles. Best makeup products in India. Best makeup brands in India. Is keratin treatment good for hair?